Iowans purchased thousands of cell phones, computers and TV’s over the holidays and the Department of Natural Resources is hoping the pieces of electronic equipment those devices are replacing don’t end up in the landfill. Theresa Stiner is a Senior Environmental Specialist with the Iowa DNR. She says anything that contains a circuit board will also include heavy metals that are considered hazardous materials. The problem of "e-waste" is not something new, but increases after the Christmas break. "It’s estimated that 100 million computers, monitors and televisions become obsolete each year," Stiner says, "there’s a huge volume of it that we’d rather not see go into the landfill." It’s believed that E-waste accounts for 40% of the lead and 75% of the heavy metals found in landfills. 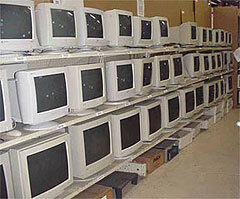 The Iowa DNR’s website , provides a list of places where you can recycle your old electronics. Stiner says the problem with recycling is it’s costly, "the recovery of the metals is not enough to pay for the cost of recycling, so typically the consumer will have to pay a fee when they drop those off." She says that fee might be 10 to 15 dollars for a small TV or monitor. Some electronics manufacturers, including Apple and Sony, now offer recycling programs and a handful of states are requiring such programs. Stiner says last year, five states passed legislation to "require manufacturers to take responsibility for their products, so that consumers aren’t left paying an end of life fee to recycle their products." That includes the state just north of Iowa – Minnesota.